While people question the value of a college degree a recent study by the New York Federal Reserve shows a degree is close to as valuable today as it has ever been. The costs to get that value have risen but even with the increased cost students earn on average a 15% annual rate of return on their investment. Of course, not every student will earn that, some will earn more and some less. We estimate that the value of a college degree fell from about $120,000 in the early 1970s to about $80,000 in the early 1980s, before more than tripling to nearly $300,000 by the late 1990s, where it has remained, more or less, ever since. Despite drifting down somewhat in the aftermath of the Great Recession, the value of a bachelor’s degree has remained near its all-time high. 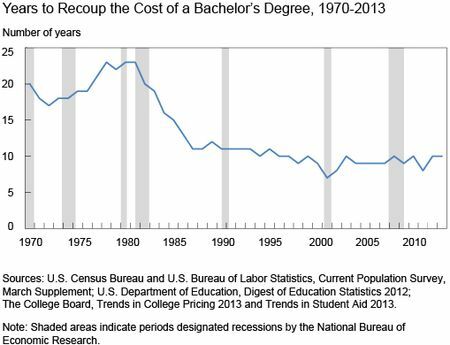 The time required to recoup the costs of a bachelor’s degree has fallen substantially over time, from more than twenty years in the late 1970s and early 1980s to about ten years in 2013. So despite the challenges facing today’s college graduates, the value of a college degree has remained near its all-time high, while the time required to recoup the costs of the degree has remained near its all-time low. So a college education is a great investment for most people. This can create a problem however, when people then assume that all they need to do is go to college and they will do well no matter what. The same thing happens in other markets. Real estate has proven to be a great investment. that doesn’t mean every real estate investment is good. It doesn’t mean you can ignore the costs and risks of a particular investment. The same goes for stocks. The article, What’s the Real U.S. Unemployment Rate? We Have No Idea, provides interesting information on the process for calculating the unemployment rate. As Dr. Deming said: “there is no true value” of any measured process. The results depend on the process which includes the operation definitions used. Over time the value of a measure (as a proxy measure for some condition you care to monitor) can change. It is important to update measures to avoid using proxies that lose value. The unemployment rate certainly has proxy issues. But there is no “true unemployment rate.” There are ways to change the process to focus on different things (make the proxy better matched to certain issues). But also it seems to me, unemployment rate needs to have other related measures that are considered in concert with the unemployment rate (such as the labor force participation rate, perhaps some measure of under-employment etc.). Those paying much attention do use other measures in concert but the last few years I read lots of different people complaining that the unemployment rate doesn’t capture various aspects of how the job market is poor (and often claiming the unemployment rate was “inaccurate” as though there was a platonic form of the actual rate divorced from the measure process. Could Amazon Significantly Impact Google’s Adsense Income? The people familiar with the matter said Amazon’s offering would resemble Google’s AdWords, the engine that Google uses to place keyword-targeted ads alongside Google search results and on more than two million other websites. AdWords is the foundation of Google’s roughly $50 billion-a-year advertising business, and Google counts Amazon as one of its biggest buyers of text link ads. This is potentially a real risk to Google. The odds of such a huge success it decreases Google’s profits are tiny (I think). But there is a real risk that the increase in Google’s profits going forward are materially affected by a well done competitor to Adsense. Adwords is Google’s platform for buying ads. Those ads are then displayed on Google’s websites and on millions of other websites. Other websites can host ads via the Adsense program. It seems to me what is really at risk is better seen as Adsense business. The business on Google’s own websites is not at risk (Google’s profit from its sites are double I think all the other sites [via Adsense] combined). If Amazon took away 10% of what Google’s Adsense business 4 years would have been that is likely material to Google’s earning. Not huge but real. Even losing the ads on Amazon’s web site is likely noticeable (though not a huge deal, for Google, for many companies it would be significant, I would guess). There is even the potential Google has to reduce their profitability, on Adsense, to compete – giving web sites a better cut of revenue.